Financial Calculations for Excel is a special financial toolbox with the essential financial calculators for users who need a simple tool. The most useful financial calculations are solved easily with this practical, but powerful set of calculators. 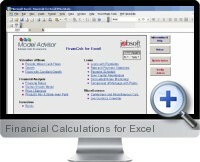 The calculators are easy to use, with many features and options. For a more advanced set of financial calculations, the more sophisticated Financial Advisor is a powerful tool that consists of 73 different financial calculators. Calculations cover a wide range of different evaluations for cash flows, loans, investments, future values, rates of return, financial analyses and personal finances.